The way I die is two taps to the head, stuffed in the trunk of a rental sedan, my body set on fire. The way I die is both arms broken, both legs broken, tossed off a cigarette boat in the middle of Lake Michigan, bricks in my pockets to weigh down the corpse. The way I die is acid in a bathtub, pushed out of an airplane, strung up and gutted in an old textile warehouse in Boston. My name is Copeland. My name is Columbus. The way I die is a shotgun in my mouth, my finger on the trigger. It is the middle of February on Mackinac Island, a tiny community off the northern Michigan coast. But Columbus isn't here to enjoy the picturesque surroundings. Reeling after the death of his wife and relinquishing his son, he lives in isolation -- in self-imposed punishment and exile. Forgotten and alone. Nameless to his neighbors. But even if he runs and hides, Columbus is never alone for long. Ten years after Columbus -- one of the most original anti-heroes in contemporary fiction -- first exploded onto the scene in The Silver Bear, Derek Haas delivers another riveting thriller that promises heart-pounding action and shocking twists until the very last page. 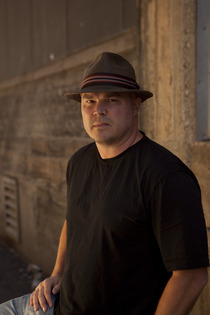 Derek Haas is the author of THE SILVER BEAR, COLUMBUS, DARK MEN and A DIFFERENT LIE, which make up the Assassin Books. He also wrote the stand-alone espionage thriller THE RIGHT HAND. Derek wrote the screenplays with his partner Michael Brandt for 3:10 TO YUMA, WANTED, and THE DOUBLE. He is the co-creator of the NBC show CHICAGO FIRE and executive produces CHICAGO PD and CHICAGO MED. Derek lives in Los Angeles. Follow Derek on twitter @derekhaas or facebook friend him.